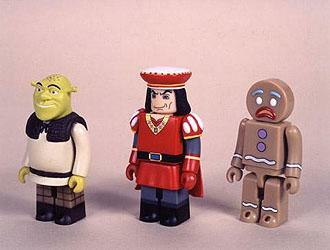 «©NCSX» Shrek, Baron Farquaad and the Gingerbread Man make up the first set of Shrek Kubricks from Medicom. Each character measures roughly 2" tall with posable limbs and exhibit an excellent resemblance to their silver screen likenesses. The Gingerbread Man includes two additional heads. The default head shows the pastry in frown mode but a smile head and a crying head may also be swapped into Bread's body to change moods.